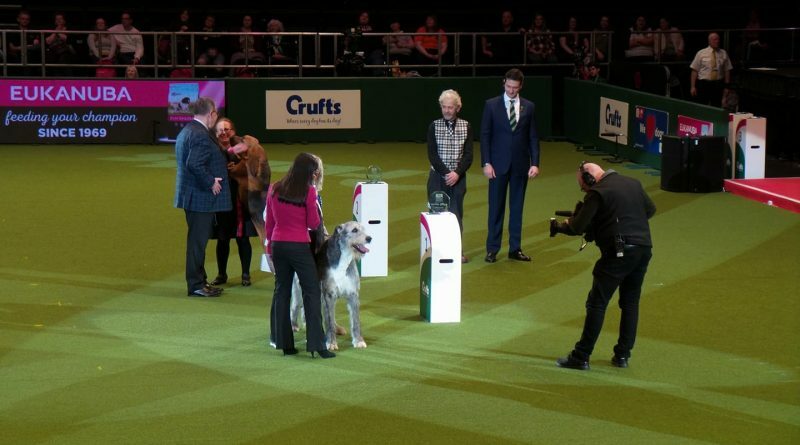 An Irish Wolfhound named Gordon, owned by Louise Pinkney from Carnaby, Bridlington in East Yorkshire, won the grand final of the Kennel Club Vulnerable British and Irish Breeds competition at Crufts yesterday (Saturday 10th March). His crystal trophy was presented by Dandie Dinmont and British breed enthusiast Paul Keevil. Gordon (official Kennel Club name Champion Hydebeck Imperial Ruler JW) and Louise won the Vulnerable British and Irish Breeds competition in front of a packed Genting Arena at the NEC in Birmingham, beating 22 other vulnerable breeds to be crowned winner. The Kennel Club Vulnerable British and Irish Breeds competition helps raise awareness of rare native breeds whose annual puppy registrations stand at fewer than 300, thus leaving them at risk from disappearing from the UK’s streets and parks. Just 256 Irish Wolfhounds were registered with the Kennel Club in 2016, but the breed will be ineligible to compete in this competition at Crufts next year, as its registrations increased to 372 in 2017 – which is very good news for the breed. The Irish Wolfhound will now be transferred to the ‘At Watch’ list, for British and Irish native breeds with between 300 and 450 registrations. In the run-up to Crufts 2018, the Kennel Club launched its Save Forgotten Dog Breeds campaign which aims to remind people about all 220 breeds of pedigree dog in the UK, including those historic native breeds that are at risk of disappearing, as they become forgotten. The campaign encouraged people to meet these breeds at Crufts. Louise commented on her win: “You stand there in the ring and you hope your dog is going to do well – otherwise you would not be standing there. And you know when your dog goes well, so you hope it might be you and suddenly the judge points to your dog. Wow! Gordon was chosen by judge Tom Mather as having the best overall quality evident from each of the 23 dogs representing their breeds. The Kennel Club launched this competition for dog show exhibitors who show vulnerable British and Irish breeds, to raise awareness of these breeds and to recognise those who are dedicated to their survival and prosperity. The competition, which was open to all 30 vulnerable breeds competing at designated championship shows, enabled dogs that are on the Kennel Club’s vulnerable breeds list to qualify for the final which was held at Crufts. A Bloodhound, Champion Harvidene Chardonnay of Badina, owned by Tina and Badger Gibson of Glasgow, was named as Reserve Best Vulnerable Breed. The Cardigan Welsh Corgi, Miniature Bull Terrier, Lakeland Terrier, Norwich Terrier, Deerhound, Mastiff, and Field Spaniel winners did not attend to contest the title. There was no Irish Terrier finalist listed in the show catalogue. All the finalists who attended were pre-judged in the afternoon. Shortlisted were the Irish Red & White Setter, Curly Coated Retriever, Welsh Springer Spaniel, Kerry Blue Terrier, Sussex Spaniel, Dandie Dinmont Terrier and King Charles Spaniel. Gerald King, Crufts Chairman, said: “Congratulations to Louise on this wonderful achievement. Her commitment and passion for her breed will help to ensure that we continue to see Irish Wolfhounds in our streets and parks. You can see a gallery of all the finalists at Crufts 2018 here.